The black chicken or commonly known as silky (silkie) chicken have black skin, flesh and bones. This unique chicken also have only four toes as compared with other types of chicken. Scientist believe that silkies chicken originated from China as it was documented during Marco Polo time. 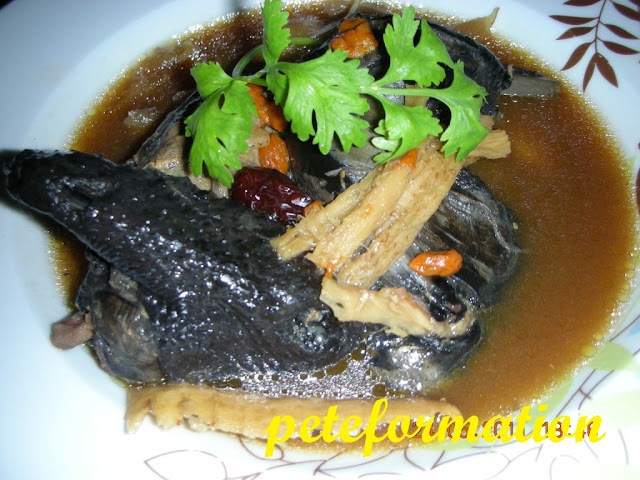 This black chicken flesh is very sweet and tender. I would normally cook this chicken with Chinese herbs like huaishan, kei chi, tong som, tong kwai, yuk chok and hongzao. You can double boil, steam or just boil this chicken just like cooking soup. Put chicken, light soya sauce and all the Chinese herbs into a pot. Pour water enough to cover the chicken. Boil for around half an hour. Turn to low heat after 10 minutes of boiling. Add salt to taste. 1) Huaishan (Discorea Yam, Dioscorea opposita) – Improve digestion, respiratory function, kidneys and increases vitality(Qi). 2) Hongzao (Red Dates, Ziziphus jujuba) – Improve Qi (vitality), nourishes the blood and reduces stress. 3) Yul Chuk (Polygonatum root, Polygonatum odoratum) – Moisturises our internal organ, balances Yin energy, clear wind and softens the sinews. 4) Tong Kwai (Angelica Sinensis Root, Radix Angelicae sinensis) – Stimulating effect on the uterus, tonic for blood and regulating menses, lubricate the bowels, improve immune system, antioxidant, protect digestion system and improve blood circulation. 5) Tong Som (Dang shen, Salvia Root, Dang Shen (Radix Codonopsis Pilosulae)) – Tonic for the blood, spleen, stomach, Qi, lungs and lowers blood pressure. It also can increase our white blood cells count. 6) Kei Chi (Lycium Berries, Lycium Barbarum) – Brighten the eyes, moistens the lungs and enriches Yin energy. Eyewwwwwwwww!!!! No, thank you! LOL!!! mouth watering.... yummy !!! U give me inspiration for cooking. I have never had black chicken before. Heard that it's more yummy compares to white chicken. I have not had this soup for ages...honestly I am aware of all the benefits, but still not very found of it. Black chicken soup is very nourish to women. Your wife is so blessed to have boiling her this soup. If happen i see black chcken in the wet market this weekend, I must buy and try this soup.. I have all the ingredients - herbal at home..
only four toes? i buy this blackie quite often but never noticed that. next time must open my eyes and check!